Biological substances are analysed and evaluated based on their electrical properties when performing measurements based on impedance spectroscopy. The measuring procedure focuses on the electrical conductivity of the material or the ratio of the applied electrical voltage to the current absorbed – also called impedance. The application field of impedance spectroscopy has undergone some developments in recent years. In the beginning, it was rather used for analysis of frequency-dependent properties in electrochemical components, such as batteries, fuel cells and semi-conductors, or in the area of geophysics. 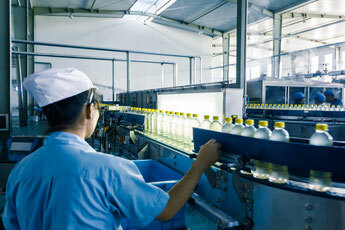 Today, the method has increasingly gained importance in quality assurance of foods. Specifically in this area, the Ilmsens device m:explore is pioneering in the measurement of liquids in production of consumer articles. The wide-band measuring principle of the m:explore offers enormous benefits in impedance spectroscopy. The ultra-wide-band M-sequence technology ensures real-time monitoring of your quality and thus your production in the specified frequency range. Known composition, mixing ratios, contamination and wear of operating materials can be monitored reliably and precisely. The additional information content gained thus guarantees for efficient use of all resources and always-high quality safety. Our system offers high long-term stability and extremely fast work. The ability of performing 1000 measurements per second across the entire frequency range permits continuous monitoring of liquids in real time, ensuring comprehensive quality control and short times to reaction within your production. Our wide-band sensors therefore are clearly superior to narrow-band ones. With a frequency range from a few MHz to several GHz, we analyse many different physical effects. The connected information lead permits detailed monitoring of your production or products.